With BSC Designer Online you can access business information from several data sources, including Excel Spreadsheet and SQL database. 1. Go to your account in BSC Designer Online. 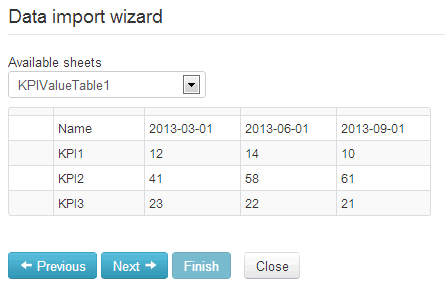 Open a scorecard where you want to import some data. 2. Go to the "KPIs" tab. 3. Click on a "Tools" menu, select "Import Indicator Values" option. 4. Select "Import from MS Excel document". Optional: reuse previously saved import profiles from the "Load settings from profile:" drop list. 5. Click the "Next" button. 6. Upload MS Excel file or select one uploaded before. You can use this example Excel project. 7. The name of the uploaded file will be displayed, click the "Next" button. 8. BSC Designer reads the file and shows the list of available spreadsheets. Choose a spreadsheet from the list and click the "Next" button. 9. On the next step mark the column that contains values, the column that contains dates, the column that contains target values (if any), and so on. 10. Click the "Next" button to preview the results. 11. To reuse this import profile later check the "Save settings as ..." check box. 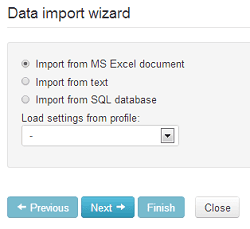 Click the "Finish" button to finalize data import. Date is not recognized. Dates might be represented in PC using different formats like yyyy-MM-dd (2016-10-23) or dd MMM yy (23 Oct 16). BSC Designer is able to recognize most formats, but sometimes you might need to specify date format manually. To do this use the "Date format" drop list. Use one of predefined formats; advanced users might want to define their own format (format guidance). I'm using import profile and the data is not correct. Most likely you have updated the structure of your Excel Spreadsheet, so BSC Designer cannot recognize columns and rows according to the information saved in a profile. Do a manual import once again and create a new import profile. I see data on preview step but I don't see it on KPIs tab. If the data was displayed correctly on the "preview" step it means that BSC Designer has recognized the data and its formats. Make sure that when you are searching for the data on KPIs tab and that you choose a correct KPI and a correct date in the calendar.